Programming Windows is a tutorial for programmers wishing to write applications for Windows using the C programming language and the native Win32 application programming interface (API). 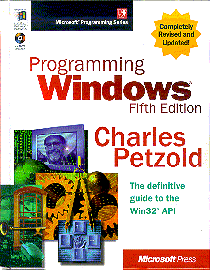 Programs written using this book run under every version of Windows from Windows 95 through Windows XP and beyond. Knowledge of C is required. ISBN: 1-57231-995-X; Microsoft Press; November 11, 1998; 1479 pages. The table of contents and a sample chapter from the Microsoft Press web site. Confused about the editions of this book? See The Five Six Editions of Programming Windows. If you have a question about the 5th edition of Programming Windows, or if you've discovered a problem with the book or one of the sample programs, first check the FAQ page. If that doesn't help, email the question or problem to pw5@charlespetzold.com. A diligent reader, Jason Doucette, has assembled his own Errata Addendum. The example programs in Programming Windows are designed to be compiled with Microsoft Visual C++. If you would prefer to use the open-source Gnu programming tools to compile the programs, Gnu Makefiles For Charles Petzold's Example Programs has complete instructions and downloads. That Web site also includes an Errata List.